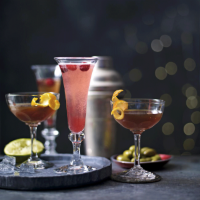 The clean, crisp taste of vodka makes a great base for cocktails and these two offer a range of flavours, from a sweet and spicy martini to a fizzy cocktail with a citrus zing. 1. Stir together the vodka, orange liqueur, lime and cranberry juice. 2. Pour into 2 Champagne flutes and top up with the sparkling wine. Drop in a few fresh cranberries and serve.